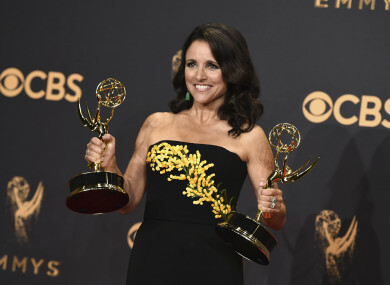 Julia Louis-Dreyfus poses in the press room with her awards at the Emmys on 17 September. JULIA LOUIS-DREYFUS says she has been diagnosed with breast cancer. The star of Veep and Seinfeld posted word of her illness today on social media. A spokeswoman for Louis-Dreyfus confirmed the posts were authentic. “The good news is that I have the most glorious group of supportive and caring family and friends, and fantastic insurance through my union. The bad news is that not all women are so lucky, so let’s fight all cancers and make universal health care a reality,” she tweeted. Email “Veep and Seinfeld star Julia Louis-Dreyfus says she has breast cancer”. Feedback on “Veep and Seinfeld star Julia Louis-Dreyfus says she has breast cancer”.